The first day of a new calendar year seems to ‘hard wire’ into many of us a need to reflect and also look forward – hopefully with optimism, a healthy dose of sceptism and almost certainly with plenty of stoicism when it comes to working in the Emergency Dept! Factoid of the Month – the Stoic School of Thought dates from Hellenistic philosophy by Zeno of Citium in early 3rd century BC and focuses on the development of ‘self control’, discipline and fortitude as a means of overcoming destructive emotions – hmmm! Capturing the emotion and excitement of the New Year of course is somewhat frustrated by having to pen one’s thoughts in the snowy grip of early November. However, when there is so much to say and do it makes for an easy flow of the keyboard. As you read this, you will perhaps be reflecting on your own initial convictions of what you promised yourself (and others) about your New Year resolutions. What have you promised yourself, your family or your team and how will you make that work – more on that later! Equally important, at work it will probably be about helping your team to stay strong and focused on delivering the best care possible for your patients. The adverse winds of the worst emergency care system performance in a decade due to awful exit block issues and continuing staffing challenges are the reality for many of us. However, in the midst of these daily battles we also know that we often deliver care of a very high standard and we could & should do more to showcase our excellent practices and innovations. The ability to ‘lift our eyes’ therefore over the hurly burly of daily care delivery is vital whether you are ; a new ACCS trainee wanting guidance on how to build a great career path, an SAS doctor building a career portfolio for yourself, a ‘shiny’ new consultant excited to be working with your new team or a Clinical Director trying to maintain stability and yet also drive sensible change / reconfiguration for your system. The list goes on. At College as I promised, we too have been ‘looking up’ and describing much more clearly our path for the future. It has been a pleasure to be stimulated and also challenged on how we define this path by the new Executive team and also Council. As you read this, you will have already seen the new strategic direction – RCEM Vision 2020 which I have asked to be put out to consultation on the website. Please do read the document and let us know your thoughts. We want to define a path that is inclusive and will allow us to have a truly positive impact on the quality of care we deliver to our patients. We also need to find better ways to support our staff so they have successful, satisfying and sustainable careers. And finally of course we will provide ever more expertise to drive for even higher standards of training, academia and research in Emergency Medicine. I have spoken already at a variety of fora and also in the supplement outlining the principles we will apply. The RCEM Vision 2020 provides the detail but we will continue to refine it over the first quarter of 2017 till we have it right. Your feedback is vital, so please contribute. There are 3 themes I am keen to emphasise. As a College, we are actively engaging with governments, policymakers and regulators to provide them with expert advice on what is required to create good system design and resilience that leads to better patient care. The concepts of emergency care ‘villages /floors’, clinical hubs, co-location, appropriate redirection and multi-disciplinary working are not new but we need them to be cost effective, integrated and ‘fit for purpose’. We need menus and model examples that you can best use in your discussions with commissioners and strategic planners. We will also be providing greater clarity on workforce models and what it means to have a well structured, sustainable job plan as an emergency physician. Some of you will have seen some of our press statements over the past month that are accessible on our excellent new RCEM website. We covered major issues such as reconfiguration (STP) plans in England, the powerful Health Select Committee report on Winter Pressures that we actively contributed to, the Bengoa report in Northern Ireland on reforming the healthcare system there and our robust response to the misleading article on staffing in EDs by the Telegraph amongst others. In 2017 we will continue to be reactive but also proactive in all of these areas as we advise, advocate and help design systems that best meet the needs of our patients. We will be publishing on key areas in the first half of the year. This year provides a landmark moment in our history. I have spoken before about what a pleasure it is that we will be celebrating our Golden Jubilee – 50 years since the inception of our specialty led by Maurice Ellis, a consultant at the Leeds General Infirmary, when the first 9 A&E consultants were appointed. There are those who suggested rightly that we should have a celebratory event, a Dinner perhaps? I believe the occasion merits much more and we will be having a range of events that allow us to celebrate the whole year round locally, nationally and internationally. More news on that soon! Interestingly, ACEP will be celebrating their 50th anniversary in 2018 and are they are keen to share good practices on celebrating success too. We also want to use the 50th celebrations to be the launchpad of our RCEM Foundation to further our charitable objectives chiefly in the areas of academia, education and research. I know that the Foundation is a project that many previous Officers of the College have been keen on for the past 6-7 years but I believe it is vital we do deliver on this in 2017 to both raise our profile, leverage our powerful brand of who we are and create excellent opportunities for our younger generation both at home and abroad. I truly believe we can make the RCEM Foundation a fantastic success and seek your active support in this area. Being able to showcase some of the excellent practices that occur in Emergency Departments all around the UK & Ireland as well as internationally by Fellows and Members of the College is something I am really passionate about. I am working with the Vice President group for us to develop a strategy for Showcasing Excellence and we will publish on that soon. Part of that strategy will be to have Annual RCEM Awards covering the whole spectrum of emergency care delivery in ED. The first Awards will be part of the Annual Dinner at the Annual Scientific meeting in Liverpool, October 2017 – so look out for application forms! There is of course much else I would like to tell you about but space is a premium. We will let you know more as plans crystallise in areas of education, leadership development and celebrating innovation both nationally and internationally. Talking of space of course, this summer will see the opening of our second building in London, Ayres Street. This will allow us to have a dedicated environment to run our exams, deliver high quality educational events and have a space for members and fellows to visit in London that they can use. As I mentioned previously this is another landmark moment for us and we will find ways to celebrate this too. We have talked at Executive about prioritising our strategy, RCEM Vision 2020, so that we can deliver well over the next 3 years or more. My 360 feedbacks in my younger years as a consultant noted a (healthy!) impatience for change. I am grateful for the wise counsel that all members of Executive & Council provide in helping me temper such enthusiasm and for us to deliver on our objectives. Please remember to acknowledge and thank them for their work ( very often done in their own time ) in order to help further our common goals. We have remarkable talent in our College and it is essential we find new ways to tap into that pool both centrally and also you in our wider membership – the ‘pact’ I have previously spoken about. And finally…I wish you luck and good fortune in being successful with your New Year resolutions – whether they are focused on your own wellbeing or others around you– if they are important, then find a way to make it happen. If not, then maybe sign up to your local School of the Stoic to help you! 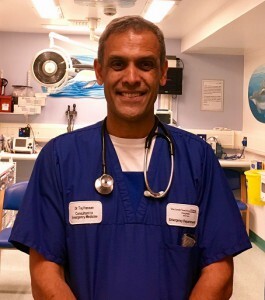 Dr Hassan, whilst not a medical profession, as a UK resident , I have real concerns that the future delivery of health & social care within this country will be very much subject to severe finance restrictions..The STP proposals being brought forward in my area of residence, Devon cover a 5yr strategy. These proposed radical changes, do not take account of the changing demographics of our county and should be looking at a minimum goal some 15 -20 yrs ahead! when almost a 1/3 of the population will be over 65yrs of age!.I am sure this situation will be replicated across the UK. Major re organisation of health & social care must be looked at in the round. I also have serious concerns re the stresses experienced by existing professions including struggling GP practices etc, caused by the current inadequacies of provision.Can we sufficiently attract, train and retain new individuals to the profession? I believe that a Royal Commission to view ALL aspects of health & social care, from cradle to grave is now appropriate, and I have placed a petition to this effect on the Government web site.https://petition.parliament.uk/petitions/183714 This would remove party politics, and enable public engagement via MPs. I do hope that as an organisation you may feel able to support my petition.